Set in the middle of the North Sea, Agramon, a place of varying terrain, landmarks and wide open fields, places the battlefield in the front yard of each realm's beachhead keep. On the day of Agramon's birth, a great earthquake tore through Hadrian�s Wall, Emain Macha, and Odin�s Gate. As they scanned the shores of the North Sea, watchmen at the beachhead keeps of Caer Benowyc, Dun Crauchon, and Bledmeer Faste cried out, startled by what they beheld. Massive waves surged over the docks, sending the dockmasters and mistresses running to the nearby towers for shelter. At the same time, a great thundering erupted from the center of the North Sea. The terrible event was unlike anything even the most seasoned lords of war had experienced. For a long moment, every battle seemed to pause, and the frontier fell silent. Immediately, Lady Benowyc, Chieftain Crauchon, and Jarl Bledmeer sent scouting parties out into the sea to investigate the disturbance. What was found was a shock to all. New land had risen from the sea: a great, mysterious island unclaimed by any realm. Word of this strange new island spread quickly among the captains charged with safeguarding the coastlines of the realms. When tales of the eerie landmass were reported to the keep lords and ladies, additional scouting parties were dispatched to gather further information. The returning scouts reported that the island stretched across the expanse of the North Sea, nearly filling it, and was riddled with corruption and populated by fiendish creatures. The name Agramon was whispered on its foul winds, they said, and all who returned from the island spoke it with despair. The keep lords hastily constructed bridges that would allow passage from the beachhead keeps to the isle, and fortifications were ordered to repulse the attacks of Agramon�s minions, commanded by a great demon lord. Even with such safeguards in place, the minions of Agramon still attacked in relentless waves. A bloody battle surged across the isle claiming many lives as the demonic horde pressed in, trying to infiltrate the frontiers of all three realms. The battle was long and hard, but each realm managed to keep hold of its own lands. Eventually, overwhelmed by the strength of the three realms, the demon lord was cast out and the corruption receded. To this day the core of the Isle of Agramon remains tainted, and only the stoutest of Albion, Hibernia, and Midgard dare to explore its depths. - Each realm has access to the island's shore from bridges and small land masses located near the beachhead keeps (Bledmeer Faste in Midgard, Dun Crauchon in Hibernia and Caer Benowyc in Albion). Players may also reach the shore entrances to the island by swimming. - There are two milegates per realm on the island, for a total of six. The main portcullis doors are destroyable and repairable. - There are no guards or other NPCs located anywhere on the island. 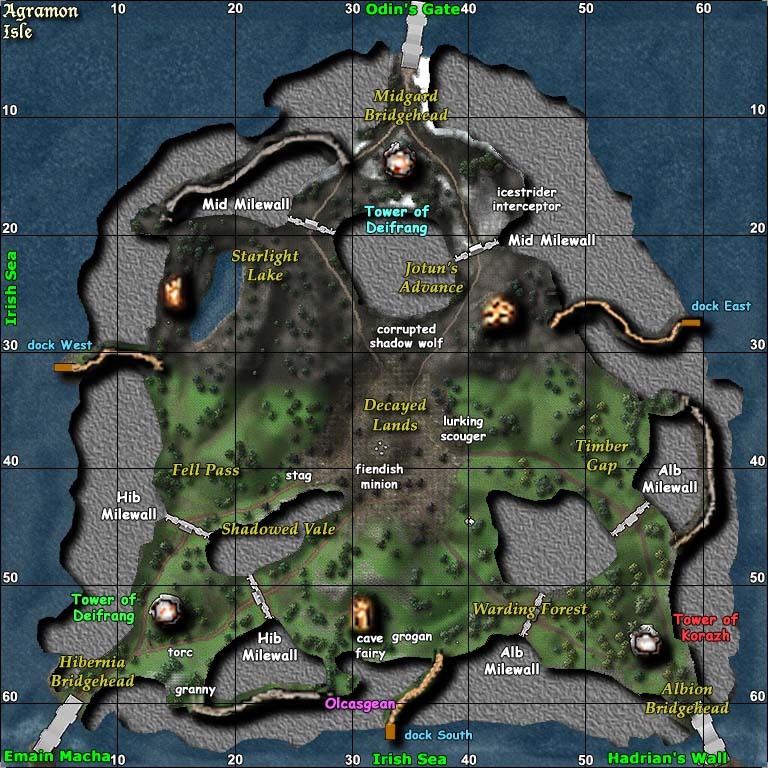 - Any player from any realm may use any realm's entrance to the island without restriction. - There are a variety of monsters available on the island to be used as pets.